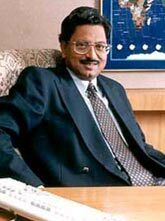 Satyam Computer Services Ltd founder, B Ramalinga Raju, his brothers and their spouses have acquired 1,065 properties with a registered value of Rs 350 crore (Rs 3.50 billion). These include 109 properties in coastal Andhra, 11 in Karnataka, 40 in Nagpur, 29 in Chennai and 876 in Hyderabad and the surrounding Rangareddy district, according to sources tracking developments in the Central Bureau of Investigation probe of the Satyam case. On the whole, the sources said, the Raju brothers and their spouses bought 6,012 acres of land, 37,475 square yards of housing plots and 87,439 square feet of built-up area. Besides Raju and his family, the CBI is understood to have discovered that former chief financial officer of Satyam, Srinivas Vadlamani, acquired 20 properties, comprising 92.16 acres of land and 2,582 sq yards of housing plots, with a registered value of Rs 9.29 crore (Rs 92.9 million). The properties were acquired in his and in the name of his family members. These acquisitions were made from the 'wrongful gains' earned by selling Satyam shares during the period the accounting fraud was perpetuated in the company. "They made hay while the sun was shining by offloading the shares while the other investors were holding on to the shares with a false hope" that the share value would rise, the sources quoted from a report. On the whole, Raju, his family members and the front companies floated by them are stated to have received Rs 2,700 crore (Rs 27 billion) by selling shares and also by pledging shares with non-banking financial corporations. Sources said CBI had come out with an evidence that Raju and his associates had created seven 'fake' foreign customers against whom 'forged and fabricated invoices' were raised to the tune of Rs 430 crore (Rs 4.30 billion). These 'fake customers' were eCare Inc, Mobitel Inc, Cellnet Inc, Synony Inc, Autotech Services, North Sea Inc and Hargrieves Inc. Though teams were formed for developing products for the seven companies, Satyam never delivered any products to them as no such company existed. Nevertheless, Satyam had raised 63 invoices against these seven companies. Fabricated emails were sent to Satyam associates to make them believe that the companies were actually existing. "Detailed analysis of the emails revealed that the Internet protocol addresses from which the emails were sent at the relevant time and date were all from within Hyderabad, which clearly shows that such emails never emanated from the seven foreign customers," the CBI is learnt to have stated. On the role of Satyam's former head of internal audit, V S Prabhakar Gupta, whom the CBI arrested recently, sources said the investigating agency was of the view that he 'has deliberately suppressed the irregularities brought out by his team'.